Holwell Sports have pulled off a major coup on the eve of the new season by signing former Premier League forward Julian Joachim. 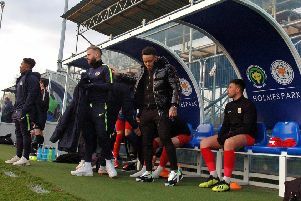 The former Leicester City and Aston Villa striker agreed to play in Tuesday’s friendly against Bingham and shortly after the full-time whistle signed on for the season. Manager Simon Daws believes 40-year-old Joachim could be the first former professional footballer to join the Welby Road club. Daws said: “It’s a real coup for us. One of the lads bumped into him playing five-a-side three weeks ago and asked what he was doing. “He said he hadn’t got a club at the moment so I got straight onto him and after some gentle persuasion managed to get him down for the match last night. “He liked what he saw and said he will play a season for us. Joachim, who made 240 appreances for Leicester and Villa between 1992 and 2001, could make his debut at Kimberley Miner’s Welfare on Saturday when Holwell begin their East Midlands Counties League campaign (ko 3pm). Their annual FA Cup adventure begins seven days later, also away, at league rivals Ellistown and Ibstock United. But Daws will be without the services of prolific goalscorer Scott Mooney who has joined United Counties League Premier side Deeping Rangers. Mooney was the club’s leading scorer in all of his five seasons at Welby Road having first joined Holwell from Asfordby Amateurs in 2007. He enjoyed two successful seasons before he was snapped up by Conference North side Hyde United. He rejoined Holwell for the 2012/13 season after spells with Corby Town in the Blue Square Bet North as well as Stamford AFC, Quorn and Loughborough Dynamo in the Evo-Stik Northern Premier League. The Holwell boss said the door would always be open for a return. “It is disappointing to see him go, but Deeping made him an offer he had to take,” Daws added. “To be fair to him he probably needs to move back up. It was a big decision for him and right up to the last minute he wanted to stay, but they offered him a good deal. Holwell’s attack also remains without the services of Sam Bettinson who is recovering from an operation to fix a ankle injury which forced him to miss the whole of last season, while long-serving playmaker Graham Keast has retired. But Daws has further bolstered the frontline with Ian Bitmead who returns to Welby Road after a stint with Asfordby Amateurs, while left-back Danny Marshall, a former Holwell youth player, also returns after successful spells with higher league clubs Stamford and Loughborough. Daws has strengthened central midfield by recruiting Dean Cropson from Sileby Town, player of the year last season with the Senior League champions, while youngsters Mike Allen and Cameron Corker have joined from Bottesford. The manager has high aims for league and knockout competitions after a decent pre-season. They have played just three friendlies in a bid to avoid the injury crisis which beset the previous pre-season, and they have brought a 1-0 win at UCL side Sleaford Town, and home victories against Greyhounders and Bingham. He said: “We will be aiming for the top five and also for good runs in the cup competitions. “We have been given a tough start at Kimberley and if we are not at it we will get found out. “But I’m pleased with how pre-season has gone and Julian joining us has given the club a real lift.